I must start out by saying that I, personally, have never been a victim of racial profiling. In fact, I might have benefited from reverse racial profiling occasionally since I'm white (for the record, my genetic makeup is over half Germanic, with Scottish and Irish thrown in for good measure). I believe racial profiling hurts everyone in a community, which is ironic since the people who use racial profiling firmly believe that the practice helps communities. I have a friend, Tiffany, who lives in a nearby community, Acworth, GA. Tiffany and her brother get stopped by the local law enforcement about 2 dozen times every year for the same crime - DWB. Never heard of DWB before? Then chances are that you are white, because DWB stands for Driving While Black. Yes, I live around here. Yes, I have a driver's license. No, you may not search my vehicle. Why did you pull me over? Oh, because you thought my brake light was out. Wow - it seems to be working now. They never get tickets, but they have gotten the message that the police do not like black people in Acworth. That is problem number one with racial profiling - the practice leads the people who fit the profile feeling as though the local law enforcement is negatively biased towards them (which they are.). That leads people to mistrust the police, causing a whole new raft of problems. Problem number two is the real conundrum - racial profiling creates a self-fulfilling prophecy. Think about it. If a police officer pulls over black people two times more than white people, simple probability says that the officer will find two times as many black criminals. That leads to more racial profiling, leading to bigger probabilities of finding black criminals v.s. white criminals, leading to more racial profiling. The vast majority of today's "statistics" that support racial profiling rest on this type of biased information. Racial profiling does not lessen the number of criminals in non-profiled groups. It may lead a police officer to pull over the wrong vehicle or overlook the real criminals in search of profiled citizens. As I stated before, racial profiling leads to distrust of the police, which leads people to handle situations better handled by the police because the people don't want the police involved since they cannot be trusted to do what is right. 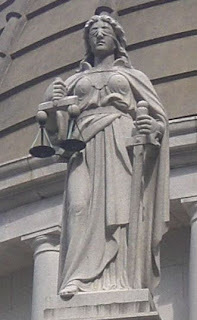 A basic principle of our legal system is presumption of innocence - a person is considered innocent until proven guilty. Racial profiling goes directly against this principle - people are presumed guilty until the officer finds them innocent. So why am I writing this post? Why do I care? I care because if we ever want this practice to stop, we all need to stand up and acknowledge the truth of what is going on. Because I feel like I am silently condoning this practice if I do nothing. Because I want my children and grandchildren to live in a better world, and getting rid of racial profiling would be a step in the right direction.